…my husband. He is probably my biggest fan (well, I have to have one, surely?). I was reminded of this when reading a piece in a recent issue of Writing Magazine by fellow Crooked Cat Publishing author, Lorraine Mace, aka Frances di Plino. She sadly lost her husband a few months ago. She explains in her article how he always had faith in her even when she didn’t and promoted her unceasingly. I am lucky to have one like that, too. I don’t often ask his opinion of my writing while I am doing it. This is mainly because involving your relatives or close friends at that point is tantamount to divorce or estrangement. I prefer to ask people at a certain remove to critique my writing. It’s easier for everybody that way. 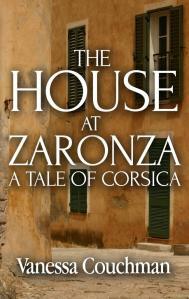 So it was with some trepidation that I formatted a version of The House at Zaronza for his Kindle. This was before I had submitted it anywhere, except parts of it for critiquing by my peers on Writers Abroad. Happily, he loved it and even had a little tear in his eye when he had finished reading it. Since then, and the novel’s subsequent publication by Crooked Cat, he has been its indefatigable promoter. When I gave a talk at the Parisot Literary Festival last October, he stood up at the end and told everybody how I had written it while he sat on the other side of our partners’ desk informing me of the weather forecast and other sundry items. He takes every opportunity to tell people about The House at Zaronza and to encourage (coerce, more like) them to buy a copy. This can be a double-edged sword. Recently, he met some friends at our local market when I was elsewhere. When I got home, he proudly announced that he had told them about the book and where to buy it. By chance, we bumped into them again a few days ago. “Have you bought it yet?” he said. I squirmed. But, then, I would probably do the same for him if our roles were reversed. It’s just that I would rather walk over hot coals than do it for myself. Whatever Happened to the Art of Letter Writing? This entry was posted in Fiction, Novels and tagged book publicity, Crooked Cat Publishing, fiction, historical fiction, Lorraine Mace, Novel, The House at Zaronza, writing by nessafrance. Bookmark the permalink. I feel far more comfortable promoting others, so I’m always glad to host other authors on my blog. And they kindly return the favour, which doesn’t seem so much like self-promotion! I was brought up exactly the same and even now, some years in to using Twitter and Facebook etc, there’s that awful feeling in the pit of my stomach when I promote myself. It just doesn’t sit well with me! I don’t think it gets any more comfortable but one becomes more proficient at it.